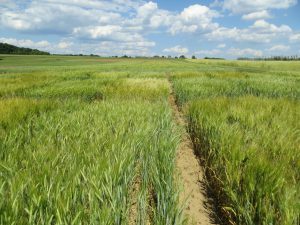 Rutgers NJAES malting barley variety trails. Photo courtesy of William Bamka. There is interest among many craft brewers in the state and region to source locally grown ingredients. The cultivation of New Jersey state-grown ingredients, like malted barley and hops, could provide opportunities for farmers. Has the thought of producing ingredients for the craft brewing industry crossed your mind? Have you wondered what the brewers are looking for? Would you like to know what is involved in producing hops and malting barley for market? Speakers will include Steve Miller, Hops Specialist with Cornell Cooperative Extension in New York; Jeremy Lees, Brewer and Owner of Flounder Brewing Company; Brett Bullock, Brewer and Owner of Screamin Hill Brewery; Bill Bamka, County Agent – Rutgers NJAES Cooperative Extension; and Steven Komar, County Agent – Rutgers NJAES Cooperative Extension. Associated industry stakeholders are also encouraged to attend as the event will be a great opportunity to network with others interested in the brewing industry. More information, registration materials, and program is available from the 2017 NJ Agricultural Convention and Trade website. Information provided by William Bamka, County Agent II / Associate Professor, Rutgers NJAES Cooperative Extension of Burlington County.